What would you like Nintendo to do, Droford? I'd like Nintendo to only develop software. Ask again in 15 years. Nintendo have already said that they make more money on Wii U games and hardware than they would if they were a best seller on PS4. Consoles are on the downswing in terms of sales, that's why mobile is the only one worth them dipping their toe into. Even with mobile, based on analyst predictions, Super Mario Run made $30 million on iPhone in 2 and a half weeks. Apple will take their cut on top of that. Mario Maker 3DS brought in that much revenue in Japan alone only not counting those that bought on the eShop. Nintendo is a failure. Shut up. I'm not saying they are a failure I just rather not pay for a Nintendo console and another system on top of that. For those in Europe, pre-orders for the system are now available while according to a leak from Gamestop, North American pre-orders will go live on January 14th. despite all of this lack of information, Gamestops across Europe are jumping the gun and taking pre-orders. It's set at a generic placeholder price of €499.99, but if you really want one, you can put some cash down on it sight unseen. Countries that are holding pre-order opps at the moment include Italy, Germany, and Ireland. There's also a rumor that GameStop just got a company-wide memo stating that pre-orders will go live in North America the day after the presentation on January 14, which does seem likely (especially since the leaker, allegedly a GameStop employee, has been correct before). Games for other systems. Stop making stupid consoles. Games for other systems. Stop making stupid consoles. obscene ammounts of money. Eh, we've been able to pre order at placeholder prices for months now. I'm pretty sure Droford doesn't care if Nintendo leaves money on the table. So the Zelda release thing is weird. It might be delayed in Europe to translate it, but still hit launch in US and Japan. Yes, new series in a line of toys called Amiibos. Do you want them to make games for consoles you own? Are you consistent about exclusive first party games or you just really want Zelda on a PS4/Xbox? I want SFV on Xbox but it is what it is. Accessory maker Hyperkin revealed several Switch accessories during CES 2017 with one being a USB-C charging cable for the system. The accessories for Nintendo Switch include a 5 ft. USB Type-C charging cable, a USB-C AC adapter with a 4 ft. cable, a car charger adapter for the console that has a 5 ft. cable. Hyperkin also announced a screen protector, a hard shell carrying case, and a travel bag with padded storage for the new Nintendo system. The developer of Mother 3 was announced to be appearing at next week's Switch event according to reports. 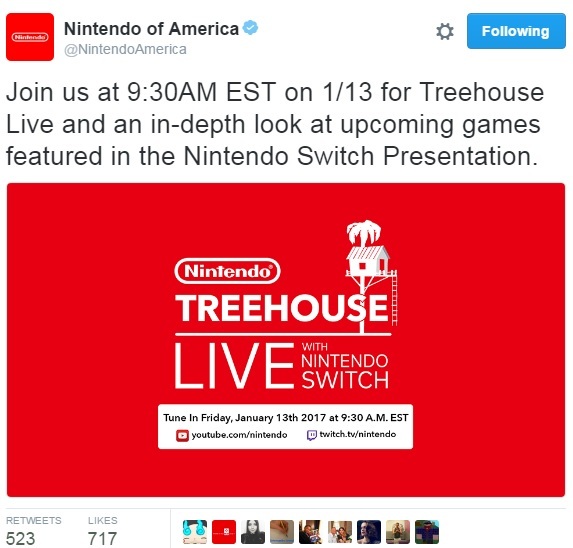 According to rumors going around the net, Nintendo and other studios are currently in the process of determine the actual launch lineup for the console. Development on almost all the major Switch games are practically done by now. Those treehouse things stress me out because they always seem like something I'm being left out of, like everyone's invited to play in the tree house but I don't get to go in, probably because they happen when people are normally at work. Suda 51 recently teased he wants to make a "No More Heroes"-like defining game for the Switch. If that's coming out, I'm thinking Tekken 7 or MvC Infinite gets confirmed for the Switch on Friday. I can't see it being for Smash. Injustice 2 might get confirmed for switch as well if not already. I could get behind an ice themed Mario game. Ice always ups the platforming difficulty and leads to excellent aha moments in Mario games. Plus they could put an emphasis on the classic fire flower power up. I'm down. Oh good call, I forgot about that game entirely. Shovel Knight was announced to be getting ported to the Switch along with a few other platforms. Here's where things get slightly confusing. Shovel Knight is going to become Shovel Knight: Treasure Trove, and with that alteration, players will "have new options to purchase each campaign as separate, standalone games on PlayStation 4, Xbox One, PC/Mac/Linux, and Nintendo Switch." MAMMA MIA let it go. Time for a nap and then to watch the stream! An hour and 15 minutes from this post.